Okay, it’s back to the regular schedule for a while! 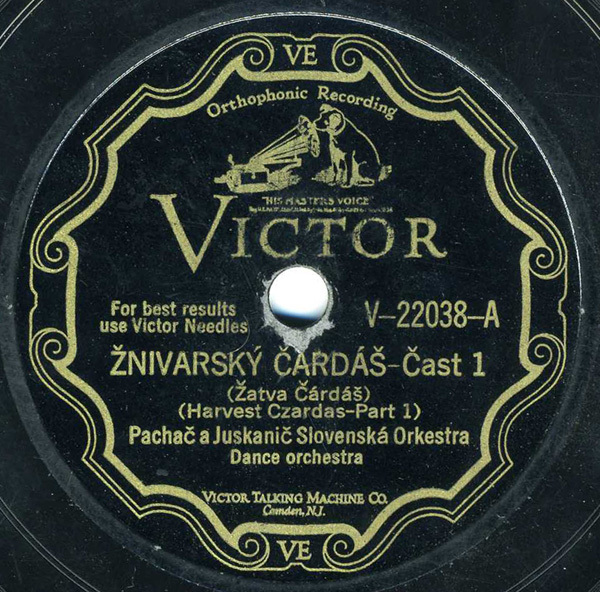 In the late 1920s, the Victor company decided to begin producing recordings of music geared specifically to Slovakian immigrants in the United States. It was a short-lived effort, yet it yielded some fascinating music, most of which was performed by a cache of immigrants (quite probably coal miners) from western Pennsylvania. I’ve heard other Slovenian/Slovakian 78s, but nothing matches the wild, almost primitive energy of these Victor recordings, which don’t turn up too often. There are several tracks by the Pachač a Juskanič Slovenská Orkestra on Mr. Spottswood’s CD, but this track remains unreleased. Listen close for the whistling! Mine God, thats my family Grandpa Juskanic! I just found this on Free Music Archive. It’s a lot of fun. Your comments made me think of the Slovak Hour on WMBS radio in Uniontown PA that continued a least into the mid-70s (when I moved out of range of the station). Lots of csardases on that show. The Slovakaires and Aristocrats were the big local group.